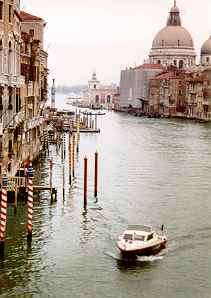 ABOVE: Looking down the Grand Canal toward the Chiesa di Santa Maria della Salute. Over the centuries, diseases have contributed mightily to great art and architecture. The Church of Santa Maria della Salute is a case in point. In October of 1630, after nearly a third of Venice's 150,000 citizens had been killed by plague, the Venetian Senate made an offer to God: "Stop the plague, and we'll build a church to honor the Virgin Mary." God came through, or maybe the onset of cooler weather reduced the population of plague-ridden fleas. Whatever the reason, the plague was stopped in its tracks. The Venetian authorities honored their promise by giving the Virgin a prime chunk of real estate near the tip of Dorsoduro, where the Grand Canal merged with St. Mark's Basin. In the resulting competition for a church design, the winner was an unknown architect named Baldassare Longhena, who had proposed a massive octagonal basilica that combined elements of Venetian Byzantine architecture with domes inspired by St. Peter's in Rome. Longhena described his design as "strange, worthy, and beautiful...in the shape of a round 'machine' such as had never been seen, or invented either in its whole or in part from any other church in the city." "If you come to Venice by sea--and any other approach is like entering a palace through the back door--the most prominent of the myriad architectural marvels that greet you is the church of Santa Maria della Salute. "As if riding at anchor at the entrance to the Grand Canal, with its balloon-like dome weighed down by great baroque scrolls, this fabulous building dominates the scene even more than the Palazzo Ducale or San Giogio Maggiore. "It is the supreme masterpiece of the Venetian Baroque--and of its author Baldassare Longhena, one of the few Venetian architects whose personality is strong enough to glimmer through the mists of history. Contemporaries tell us that he was a short dapper man, always dressed in black, of quiet and gentle manners. He had the embarrassing habit of asking everyone he met their openion of whatever work he then had in hand. But this apparent lack of self-assurance finds no echo in the magnficently extrovert and ebullient buildings he designed, least of all in Santa Maria della Salute." It's beyond the scope of this article to describe the church's architectural features and interior, which are best studied while touring the church with Mr. Honour's Companion Guide in hand. Suffice it to say that the church is massive and awe-inspiring, with a huge central space surrounded by archways that lead to side chapels. The basilica and its dramatic steps of white Istrian stone are built on 1,156,627 wooden pilings that remain intact after more than 300 years. On November 21 of each year, city workers lay a pontoon bridge over the Grand Canal from the San Marco district to the Salute church. The huge main doors of the basilica are opened, and Venetians walk across the canal to pay their respects to the Virgin Mary or--at the very least--to tradition. Gondoliers bring their oars to be blessed by a priest who recites his incantations from the church steps. The Grand Canal's scenic No. 1 vaporetto route has a Salute station between the Santa Maria del Giglio and San Marco waterbus stop. Alternatively, you can ride the traghetto (a small, hand-rowed gondola ferry) from the Campo del Traghetto in San Marco, then walk to the Salute from the landing on the Dorsoduro side.